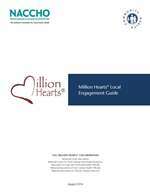 The Million Hearts® Local Engagement Guide was developed for local health departments that work with a wide range of community partners to create conditions and policies that help people make healthy choices, such as avoiding tobacco use, becoming more physically active, and eating healthier foods. Such proactive measures contribute to the prevention of chronic diseases such as obesity, diabetes, and heart disease. This guide will assist local health departments when engaging government partners, healthcare providers, the public, and other stakeholder groups at the regional, state, and local levels to advance the Million Hearts initiative.